Unfortunately the exact recipe is not longer known. My grandmother just mix this together without a written recipe. Because she lived in Germany I’m sure most of the ingredients were a little different, for example the used Herring. I’m not sure about the eggs, however I love food with eggs and some receipe I looked at had some. I know only for sure that she boiled the onions and used Miracle Whip had apples and pickles in the salad. Wash the Herring and only use the fish pieces. Cut everything else in small pieces. I added a little bit of lemon juice over the apple cubes to prevent discoloration. Boil only the onion cubes in vinegar water. Taiyaki is a filled Japanese pan cake. The traditional filling is red bean past. I’m sure this recipe will also work for standard American pan cakes and waffles. I guess it would be possible to make a low carb black soy bean past, but I had some low carb nutella on hand that needed to be used. I ordered this pan: Amazon link. I used this recipe as a starting point: source link. The little filled pan cakes are very good tasting. The cake part reminds me a little bit of waffel house. As next step I would like to experiment with different fillings. I would like to try a lemon custard or a piece of chocolate next. Heat up pan to 350 F (on my stovetop I set it on 3 (range is 1-9)). Put some oil in each mold and rub with paper towel. Pour batter into the fish molds until it reaches the tail. Move mold around to fill the fin and tail. Drop some low carb filling in deepest part of each mold, I used 5 g low carb nutella per fish. Press down with finger until everything is covered with batter. If needed pour a little more batter over filling. Close the mold and flip it immediately, turn around so batter goes in all spaces. Let cook for 2 minutes. Flip back and let cook for 1 more minute. 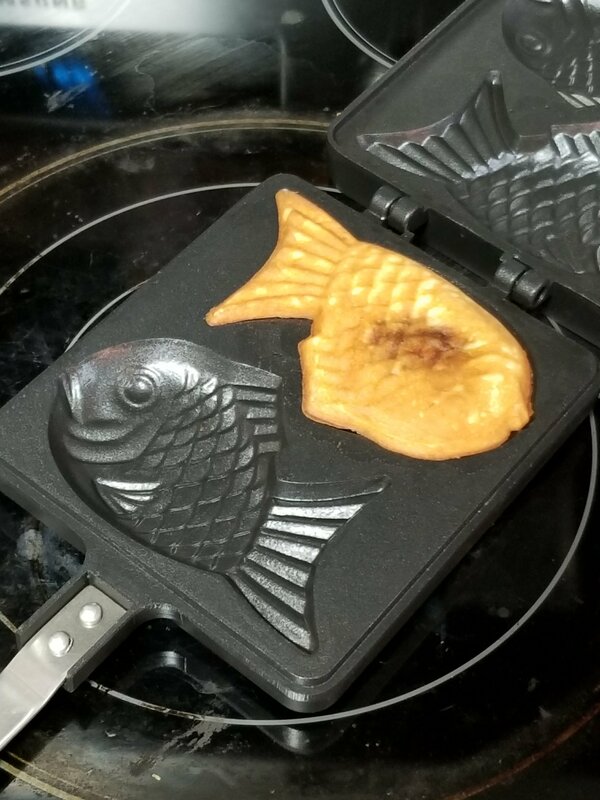 Remove Taiyaki from mold and repeat. This makes 6 batches or 12 fish for me. This post is about the PiShow 2.8″ Resistive Touch Display from Seeedstudio. I found this little 65K colors and 320×240 pixel touch display for $20 at one of there sales. The documentation on there web page is not easy to understand and everything you need is already part of the standard operating system image. I used some existing device tree overlay and merged them and changed the pins and adopted the settings from the seeed documentation. The scree is showing the picture, the touch is working with my finger and the four buttons on the side are working too. I would call this a success. Thanks to @notro for his guidance to make this example and his work in this area in general. The last step is to add “dtoverlay=pishow28” to the end of the “/boot/config.txt” file. Option "Calibration" "215 3800 129 3676"
As an extra I did install the frame buffer copy tool to copy the main frame buffer to the new touch display frame buffer. Just promoting quizzaciously for Vsauce. Test GUI for Grbl without Arduino using the Simulator and virtual com port under GNU Linux. Now that everything is working I can finally test the new SourceRabbit GCode Sender program. chrubuntu: zram-config is working wonders if ram runs out… no more freezing desktop. I’m using chrubuntu on a acer 710 since a long time and it works well, but sometime I ran out of ram and the PC freezes, this happens a lot with Chrome if I open multiple tabs. I was just looking for ways to limit Chrome ram uses but stumbled on the zram stuff and it looks like this helps. I was able to open 15 tabs with different pages and no crash. 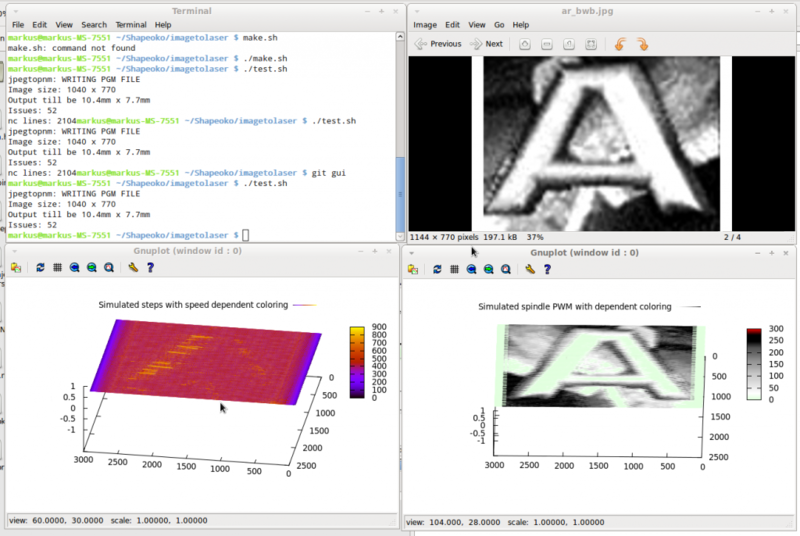 I did find imagecarve a GPL V2 open source program. After mapping the Z axis to S spindle values it looks like the g code it spits out could work with my laser. I only did test this with the greate grbl simulator, but I would guess after some more tweaking it should work on the real machine too. Here is my Github project with the source files. Looks like the image gets flipped when burned, but I flipped it back for this page. 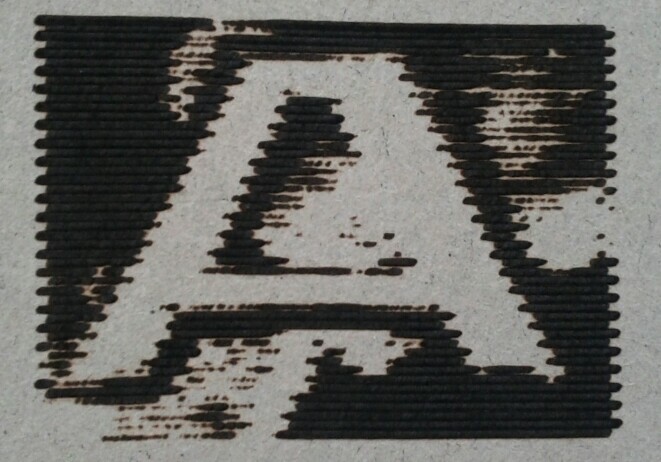 I think cardboard in not the best medium for laser engravings, it burns too fast.